A common topic of discussion among gamers reminiscing about their past is, "Which adventure modules have you run more than once?" I would contend that how one answers that question says a great deal about when one was introduced into the hobby and/or one's early experiences in it. I would hazard to guess that the majority of self-identified grognards would be able to list several modules they'd run more than one time. I myself could regale you with multiple tales of my having run, for example, David Cook's Dwellers of the Forbidden City, at least a half-dozen times, often with the same group of people. I expect this general pattern is true for many old school gamers, while it's something most younger players can't even imagine. How could I have possibly gotten multiple uses out of a single module whose page count didn't even break 30? The answer is quite simple and it's this: old school modules were, by and large, descriptions of adventuring locales, whereas new school modules are plotted (loosely or tightly) adventure stories. That's not to say there aren't elements of plot in many old school modules. 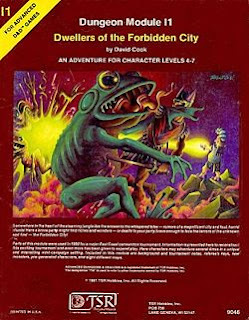 The aforementioned Dwellers of the Forbidden City includes a backstory about caravans being raided by mysterious enemies and the PCs are hired to go and find the source of the raiders and stop them. By the same token, many more strongly plot-driven modules, such as those in the Dragonlance series, include extensive descriptions of locales. There's a difference between the two types of modules, not merely in their focus -- which is important -- but also in their content. Dwellers never explicitly deals with the question of exactly who is behind the caravan raids. Presumably it's the yuan-ti, but the matter is left rather vague (someone can correct me if I'm mistaken on this point) and, at any rate, the backstory is there as an excuse to get the PCs to venture into the jungle and find the Forbidden City and its denizens. The real "plot" of the module is what happens to the PCs once they're there, not something the author has scripted in advance. That's patently not the case with the Dragonlance modules, whose entire purpose was to advance an epic story in which the player characters can take part but the general outlines of which were mapped out not by the referee but by the modules' authors. If you're looking for a good signpost in determining where the old school ends and the new one begins, it's the shift in emphasis from locales to plots. It's not a hard and fast division; there are examples of both on either side of the line. Nevertheless, I think the expectation that a module "tell a story" rather than provide a location for a story of your own devising is a good indicator of where one's gaming sympathies lie. Since the late 80s at least, roleplaying has largely been defined as "freeform storytelling" and, given that, it's no surprise that adventure modules have been structured accordingly. Now, I don't actually think that definition is incorrect but it's misleading, because it doesn't take into account the increasingly heavy-handed role played by the manufacturers of modules, who've largely usurped the role of the referee in creating and maintaining his campaign world. This is why, though I love the folks at Paizo dearly, I've never been a fan of the whole "adventure path" concept that they've developed into a high art. I'd love to see them produce more location-based modules myself, but I expect they know their fanbase better than I do. To some extent, I expect that the shift away from the location-based approach is a concession to the oft-repeated saw that gamers no longer have as much free time to make things up as they once did. I think this is hooey myself. More to the point, I do not favor the abandonment of modules entirely -- far from it! Rather, what I advocate is that modules should be made more, well, modular and that means providing lots of options and alternatives that a referee can then use to make its contents his own rather than someone else's. When I was a kid, I may have had lots of time to waste that I no longer have today. I can tell you, though, that I didn't spend hours and hours planning out my adventures, most of which were seat-of-the-pants affairs. What modules gave me was a structure -- map, room descriptions, game stats, etc. -- onto which could hang the story my friends and I created as I refereed their adventures. What I think has happened over the years is that, because "adventure module" has become so strongly associated with the notion of a pre-made adventure story, gamers now simply recoil at the notion of having to "make up the story yourself." They see it as too much of a chore, when, in point of fact, creating a plot/story is the easiest part of being a RPG referee, not the hardest. I'd love to see some modern day easily reusable modules. Perhaps I need to write them myself. This is why I enjoy reading your blog. You have been able to articulate things that have been lurking in the back of my mind for some little time now and have really made me think about them. ...and it is the funnest part. I love letting something like the reaction roll or morale check make me try to dream up what might happen next. Do the lizardmen who have a favourable reaction roll become allies? Does the big bad guy that fails his morale check escape to seek vengeance at a later date? Thinking on your feet and using your imagination are the fun stuff. ...I have been thinking about whether the “adventure path” and location-based module design are exclusive of one another. Obviously not, as the GD-series showed. Based on the popularity of Paizo’s products, I think that an old school-style adventure path could be an excellent means of showing the wider RPG audience the benefits of the old school gaming style and hopefully increase the size of the market for such products. However, I am not too sure what shape such a product would take as I don’t think a new GD-like super module would be well received by the market when compared to the Paizo stuff. Dwellers is without a doubt my favorite module to run as a DM. For many years it was never even mentioned by other DMs I've encountered, so I've always thought that it was just a fluke on my part. As you've pointed out, Dwellers succeeds simply because it is a simple framework that allows the DM to graft his own flesh onto and create a unique locale for his players to explore. Can you play it "right out of the box"? Yes, but there's so much more you can do with it, it be a shame not to flesh it out more. It also just oozes the pulp fantasy inspirations that started this whole game. Seprent men, steaming jungles, and the ruins of an ancient civilization. It doesn't get much more pulp than that. I don't remember there being a ruby the size of a fist guarded by a giant snake and/or the undead in the actual text of the module, but you can be damn sure that there's one in the fleshed-out version that I run. Great blog, James. I look forward to future entries now that I'm caught up. Well, Keep on the Borderlands was really fun from both sides of the screen. A simple setting with lots of room for modification. I actually ran a "Back to the KotB" and moved a lot of the monsters around, including moving the gnoll tribe out into the plains. As I'm not a regular DM, its actually nice to have a setting and plot layed out for me. At the same time, if I were to run something of my own creation, it would probably be more locale based, although a lot would be predicated on what the players wanted. Our group is fairly used to playing plot centered stories, and our regular gm is really good at putting them together, so our expectations in this area might be different from the average grognard. Oh yeah, I think every group I've ever played with has run "Against the Giants" at least twice. To some extent, I expect that the shift away from the location-based approach is a concession to the oft-repeated saw that gamers no longer have as much free time to make things up as they once did. I think this is hooey myself. Then how did Gygax (a father with kids) have time not only to write his own adventures but create the game? Bear in mind that I don't actually believe that gamers today have less time than they did in the past, but I do think that gamers (and game companies) believe that they do. If I'm right, some of the shift toward the "story in a box" approach to adventure modules is based on a misapprehension rather than firm knowledge of the realities of the market. I know you don't believe it. I just find it so nonsensical because it fails the basic logic test I gave above. What I suspect is really going on is some people did spend all their free time (or much of it) on RPGs as kids. I know I did. Thus, they don't have as much time as they did thus it must not be possible to create your own stuff. Which gets it backwards. Kids are able to prep more/more detail/etc, not able to prep period. On a different point, modules are where I lose my old school points. I've never played or run T1, the GDQ series, White Plume, Peaks, etc. I owned G1, B1, B2, S1-4, and T1. Plus a bunch of JG stuff. I stole tons from them but never actually played them much. I think that might come from buying Holmes bare and GW boxed. I never had modules until I'd been making my own stuff for a couple of years. What's so funny is I consider myself lucky in that. You don't lose any old school points with me, Herb. I think doing it yourself or stealing bits and pieces from modules as inspiration is very old school. I think many modules are classic, of course, but not necessarily representative of the way the early campaigns were played. Often, the modules were a more tournament style affair, the dungeons more like well-defined lairs, rather than chaotic and sprawling underworlds, et cetera. I think the oldest of the old school is for a referee to create a sandbox wilderness with at least one deep and sprawling underworld dungeon of his own devising (with lots of space, including relatively empty areas), and probably other less expansive dungeons and sites, as well. The kind of underworld dungeon I associate with this kind of play doesn't translate into a publishable module very well. I wish I could claim my early stuff was that inventive or good. A lot of it was poorly done knock offs, but at least they were mine. Easily coming to mind is the Three Forts of the Dwarven King. Terry Brooks would probably call them derivative. Still they later became, with much revision, a huge underground complex which was the center of what I consider my first real campaign. Which gives me an idea for a blog post. However, I am not too sure what shape such a product would take as I don’t think a new GD-like super module would be well received by the market when compared to the Paizo stuff. I have some ideas on this score and may make a post about it in the future. Suffice it to say that I agree with you that, in principle, there could be a merging of the adventure path idea with the locale-based modules of old. The resulting fusion would be a weird one, but it might just be the means to square the circle I'm looking for. It also just oozes the pulp fantasy inspirations that started this whole game. It does indeed. That's part of why I love the thing. The whole module drips with pulpy goodness and I can't help but want to pick it up and play through it again. How about something like the appendix to the LotR: maps, people, and what's going to happen in the next X days/months/year. Those things that will happen would be 1-5 plot lines that can be wound up and happen exactly as written unless you add a new force. So you do, you call them PCs. See, that addresses my primary complaint with story modules. Either the PCs are the main characters and their actions are constricted by the plot (Pathfinder) or the plot happens regardless of the PCs and they're mostly tourists (Tribe 8). I rejected the shift in modules from locales to plots. Oh, I tried a few plot modules here and there, but by and large, I found them not interesting. As to modules and time. I certainly have less time as an working man, and even less time as a married man, yet I'm in the process of working up a mega-dungeon of my own. One of the things that makes it so possible - I can write up an encounter in a minute or three. The added complexity of D&D 3.x made (which I didn't exactly run - I ran Monte Cook's Arcana Unearthed/Evolved) made it such that I spent a couple HOURS writing up an encounter. I started off running modules not so much for time saving, but for the ideas, and because they were there, and I needed something to spend my paper route money on, and then having them, I certainly wanted to run them. Later in college, when I stopped running AD&D, the modules still got used, but converted to whatever system I was running at the time (sometimes on the fly, sometimes pre-prepped). My biggest reason for going back to OD&D isn't so much for the old schoolness as for the simpler rules and simpler prep. But I also like that it enables dungeon exploration. A mega-dungeon wouldn't work well in 3.x for a number of reasons, from rules complexity (and longer times to run an encounter) to the 13 encounters = 1 level gained. As an old CoC head I find all this hating on plot a bit mysterious. Most CoC adventures are mysteries the characters stumble upon and then decide to unravel. The best of them depend very heavily on player action in order to resolve them. I haven’t run a lot of modules, and I am almost always disappointed by the results when I do. I also think I do better when I don’t worry about being original, steal liberally, leverage cliché, and minimize prep in favor of winging things. So, for me, they tend to be false time-savers. I think the trick is to have an idea of what would happen sans the character interaction and then being able to have this adjust to the characters actions as they explore with the locations. I think that the point herb was trying to make (and herb, don't let me put words in your mouth) was his dissatisfaction with how many modules have a story that is basically like a bus on which the characters go for a ride. I think that the point herb was trying to make was his dissatisfaction with how many modules have a story that is basically like a bus on which the characters go for a ride. That's why I cited Tribe 8 specifically because it has brilliant and original ideas, but the "adventure books" were basically novels you got to narrate to the players while they moved their character from theater to theater. Each of these games is clearly written by a GM who would very much like all the players simply to shut up and play their characters without interfering with "what's really happening." That describes too many modules with plot. This really was an amazing module. It introduced one of the best D&D villains, the Yuan Ti, and tons of other interesting creatures and their own factions. For a similar type of module (but not as awesome of course), check out Mechica, an old Dragon magazine mdoule, which is based in an Aztec/Mayan-city. I'm not sure if a gaming career that started in 1989 counts as a "grognard", but the question of which modules I've run more than once piqued my interest. B3 - Palace of the Silver Princess. This was the first module I ever owned. My first D&D game was the Mentzer Basic Set. B3 was the only module I could afford (by virtue of being in the used section) in the appropriate level range. Being my first and (for a time) only module, it got a lot of use and a fond place in my heart. Tomb of Horrors. This is one of the best one-shot adventures ever done. I've run it many times. Three Days to Kill, Death in Freeport, and The Sunless Citadel. These are what I typically think of as the "inaugural trilogy" of 3rd Edition. Three Days to Kill has served as both a solid one-shot and as the launching pad for a campaign. Death in Freeport has launched two campaigns. I have run or played The Sunless Citadel no less than four times, making it the module I've used more than any other. (b) I find it entertaining and enlightening to interject someone else's viewpoint. I'm also an actor, and one of the things I love about acting is taking a character created by someone else, interpreting it, and creating it anew in my own performance. Using a module designed by someone else has the same type of appeal: It injects both a freshness and a different kind of creativity into my game. Locale based modules works well with the Spiral Method, and I find it mitigates the tendency toward Railroading. I'm all for it. I just finished running Dwellers with a group of 18-year-old players. I adapted the rules to the Pathfinder game, but kept most of the setting & monsters intact. Since it was the last game of the summer, I threw in a lich and a shadow demon to see if they could survive some extra challenges. A great time was had by all!